Try PolyBeam it is simple and easy to use, like WinBeam. Determine sectional forces and reactions in statically indeterminate beams or take it one step further and design your steel- or timber beam. 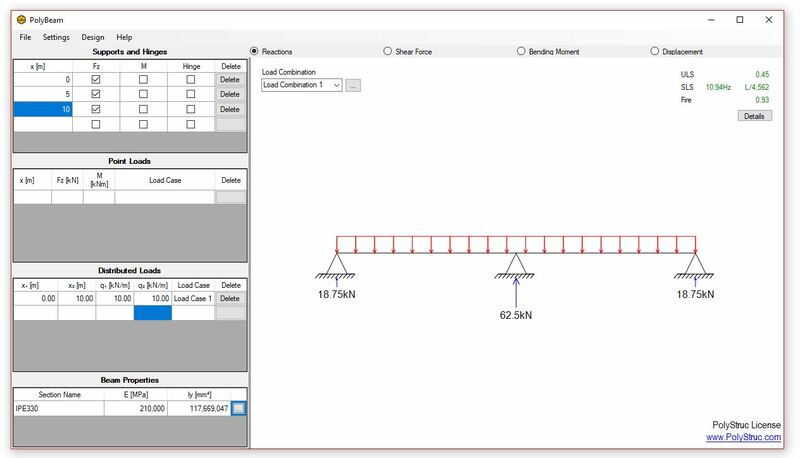 PolyBeam and WinBeam are both simple to use beam calculators where the user easily defines supports, loads and section properties. Based on these inputs the reactions, sectional forces and deflections are calculated. In PolyBeam it is very easy to document your work with a simple and great looking PDF report. It is all handled with just one click and you can set up your own template to customize it as you want. Steel- and timber sections can be verified in both ultimate limit state (ULS) and serviceability limit state (SLS). These options has been included while the simplicity in the interface is retained. Below some of the similarities and differences between PolyBeam and WinBeam are listed. Plastic hinges allows for a redistribution of sectional forces when the capacity of a statically indeterminate beam is reached in one section. In some cases, this can increase the capacity of the beam by more than 20%. This redistribution can be avoided by manually entering a moment of inertia of the beam. Load combinations allow the user to define both SLS and ULS load combinations by multiplying the characteristic loads by a user defined factor. With this addition it is easier to design the beam. If the user doesn’t define any load combinations, then all loads will be applied to the structure like WinBeam and the both ULS and SLS will be determined. The beam can be designed for shear, bending moment and lateral torsional buckling according to Eurocode 3, this feature makes it easy to choose the most optimal steel section. With this new feature it is possible to determine whether the beam is prone to vibrations. This is often of interest with floor separations and staircases. The steel beam can be designed for shear, bending moment and lateral torsional buckling for the standard time-temperature curves (R30, R60, R120) or for a user determined steel temperature. PolyBeam is developed with an interface that allow the user to define loads, supports and cross sections from the same menu panel. Everything is immediately shown in the graphical area and the sectional forces and reactions are determined.